Provided you have a southern or western facing window in your home that receives plenty of light, you can grow most types of peppers indoors in containers. Pepper plants require temperatures of 60 to 75 degrees F and soil that is well-drained and fertile to produce the best fruits. Mixing a good quality potting soil with well-matured compost will ensure a good indoor pepper crop. 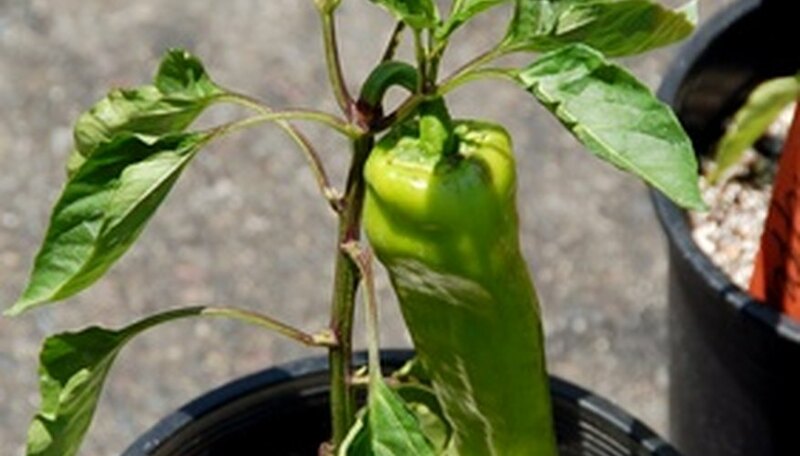 Select a 2-gallon container for each pepper plant you wish to grow. Fill the bottom of the container with 1 inch of pea gravel. This will help with drainage when watering the pepper plant. Make a soil mixture by combining three parts potting soil with one part mature compost. Fill the container 3/4 full of the soil mixture. Water the soil until it is moist throughout the pot. Press 3 to 5 pepper seeds into the soil near the center of the pot. Cover the seeds with an additional 1/8 to 1/4 inch of the soil mixture. Place the pot in a warm area of your home. The seeds should germinate within 10 days and seedlings should appear within 12. Place the pot in an area where it will receive sun at least 8 hours a day. Water the seedlings just enough to keep the soil moist. Thin the seedlings when they reach 2 inches high in the pot, until only one plant remains. Choose the strongest-looking seedling as the pepper you will grow. Turn the plant at least once daily in the windowsill or other sunny location so all sides of the plant benefit from the sun. Failure to turn the pot often can cause spindly or weak pepper plants. To help germinate the pepper plants, cover the pot loosely with plastic wrap; this will create a greenhouse effect. Once the seedlings appear, remove the plastic wrap. Indoor pepper plants can become infested with whiteflies or aphids. An insecticidal soap will help control aphids, while fly paper can help control whiteflies. Check the pepper seed package for any additional instructions for the variety of pepper you are planting. The package will also tell you when you can expect your first harvest.